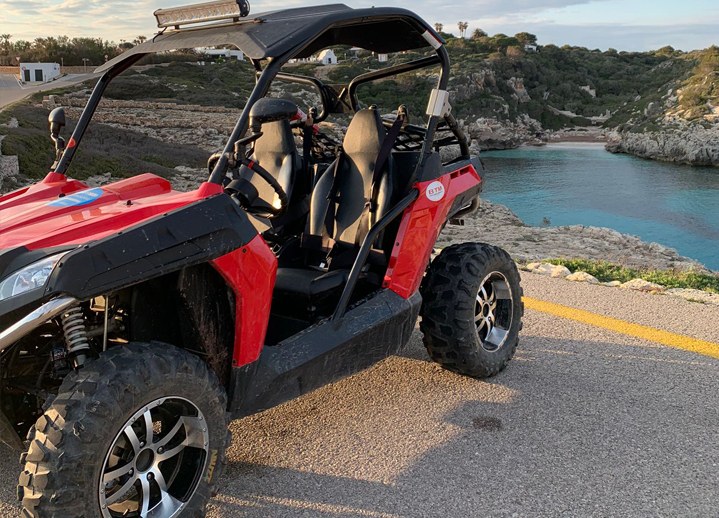 • It will be necessary to deposit a deposit of 200 € per Buggy / Quad in cash, which will be returned to the return of the vehicle without damages. • Optionally we have a full insurance with a franchise of 100 euros at a cost of 10 euros / day. • Cancellations made 48 hours before the reservation deadline will not be refunded. • The driver must be in possession of a valid driving license type B1 and D.N.I. or passport. • The driver must be 21 or older at the time of rental. • Reservations by bank transfer will be made to an account number that will be provided upon request. They will be confirmed with the proof of bank payment indicating: vehicle, day, type of rent. They will be reserved with 50% of total cost of the rent and always according to availability. • Rental budgets that are sent by email will be valid for 7 days. • All prices VAT not included (21%). What autonomy do Buggies and Quads have? - Our Buggies and Quads can drive up to 80km with a tank of gasoline, in normal driving. Are Buggies available for business events? - Yes, contact us to detail everything you need and we will do everything in our power to present the best solution for your company or group event. - The vehicles have the compulsory insurance of circulation included in the price. The insurance against damages has an extra cost of 10 euros per day with a franchise of 100 euros. Can two people travel on Buggies or Quads? - All our buggies / quads are homologated for two people. Only drivers authorized in the contract can drive the corresponding Buggy or Quad. What happens if I have an accident or if the Buggy / Quad is stolen? - The vehicles are only insured against damage to third parties. The customer will have to take care of any damage unless he has subscribed the insurance against damages, in which case the maximum the client will pay will be 100 euros. What if the weather is especially adverse? - In principle, no climatic circumstances should prevent the normal development of the activity. Discover the beauty of this island and travel in different ways its magnificent coves and spectacular interior landscapes. Our Buggies have the following characteristics: 260cc, homologated for two seats, automatic, with all safety elements approved, always counting on our assistance in case of any incident so that you enjoy a smooth driving without mishaps. This way, you will be able to move as you wish by the roads authorized by the competent authority, always counting on our advice and experience to trace a route for you adapted to your preferences. 260cc engine, water-cooled, 4-strokes, automatic gears, 20 CV, Speed: 75 Km/h, Range: 100 Km. ECC approved for two passengers.